From the episide 5 of the drama "Tomorrow Love"
Finally Bomusu and other members in "the circle ," critique of cultural work foundation formed in episode 4 decided to go to the overnight camp as the first activity. Bomusu and Honson has no choice but to come to fight because Miri and Chinson were tangled with some hoods. Honson was unexpectedly tough (strong and brave)in a punch-up. I have a better opinion of Honson now. I give him more credit. It wasn't so much that I loved him. 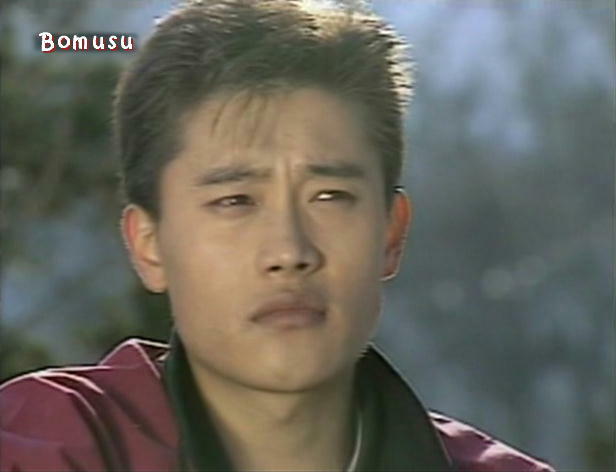 And Bomusu,of course he was ultra tough(strong and brave)and real cool. Soniru tried hard without running away even though he was weak. To get back to my original point. Although they went camping,Miri had the misfortune of losing some of their money. Miri and other menbers noticed it while on a trip. Thy gathered their remaining money,it was 8,000won. In this way,Bomusu went out of the house(place) to play some billiards games with Honson to add to their money. At that time Bomusu and Honson were at their best. They won some games there and got some money. Honson and Soniru noticed and gave them help. Contrary to my expectation, Honson was strong. Contrary to appearances, he was cool. Although Soniru was weak, he never ran away. He hanged on to the other person's legs even though he got a good beating. And Bomusu who noticed the trouble joined in the fight. He was very strong and cool. I love him. All their money which Miri thought has lost, actually was sandwiched (the money-their money)between (-into)her book. Miri was confused about it. For this reason, the money came back to them at the end of the trip. Although they had some accidents, the travel seemed to be memorable and nice. Chinson and Miri participated in the matchmaking party with a man of Seoul National University. Miri had quite a chat with the person and it went off well. And then Chinson became angry. Maybe it was her unconscious jealous. Honson fell in love with a beautiful lady in a cofee shop. ①Honson was helped by Bomusu to make romantic overtune to the lady. ①’Honson had help from Bomusu to make known his love to the lady. But .....she（He?） was a gay. Shock!